I am kicking stones from the bridge into the shallow sandy creek below. I lean upon the rusty old iron rail, and I am kicking stones! I watch them as they fall and wait for the splash, the sploosh, the plip, the plop, the rapid stutter of multiple small stones kicked all at once. 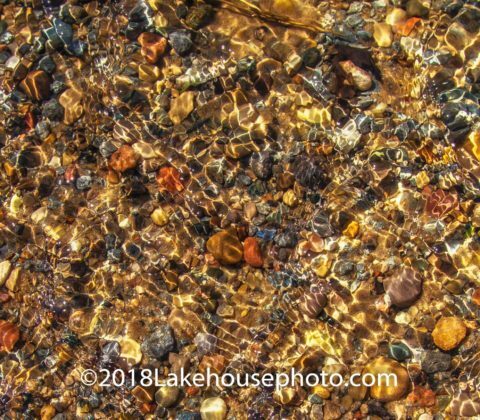 I wonder what will become of the dusty old rocks now washed clean by the flowing water. Will they stay lodged in the bedrock, or continue their journey toward the river or perhaps, even the sea? Over the years, have I kicked enough stones into this creek to have forever changed its path? Or does it take just one? What about the creek of my life? Have I kicked enough stones into its current to change the course of a life? Have my words, thoughts and actions had an impact on others? Have they been kind, compassionate, and caring, or have they been biting, ugly and cruel? Have I been reckless with the hearts of others, or have I tended them like a sacred garden? Have I helped or have I hurt? I suppose a bit of both. And where have I resided in the creek of life? High and dry on the creek bank only to bear witness, or fully immersed in the raging waters of the spring. Did I seek the comfort of the slow-moving shallow water, or did I venture deeper into the rapids only to cling to boulders for safety? Was I ever courageous enough to wade in without hesitation, let go, and let the current lead me to my destiny? I wonder, what is the sum of my life? Have I created a splash, a sploosh, a plip, a plop, a stutter or a ka-thump? Will I, in the end, arrive at my final destination washed clean of this life as a finely polished stone, or weather-beaten and broken? I cannot know the answer. What I do know is that the tally has not yet been totaled. Though there is little I can do to make amends for the misdeeds of my past, I can go forth today, tomorrow, and all of my tomorrows with love, kindness, and compassion. I will throw caution to the wind, and step boldly into the creek, let go, and allow my destiny to unfold. 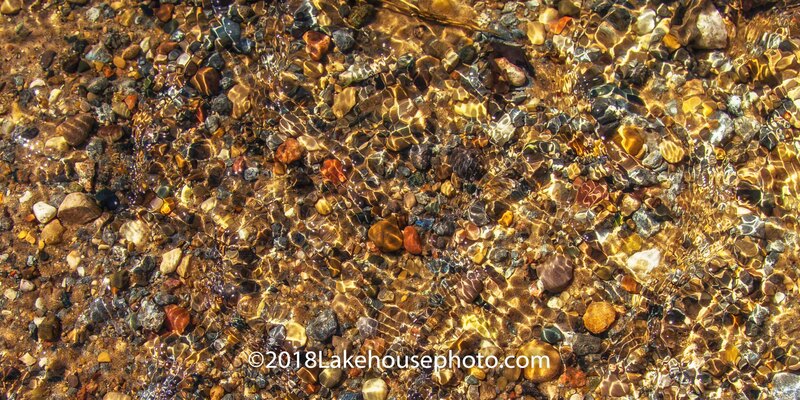 © Gail Howarth and Living At The Lakehouse, 2018. Unauthorized use and/or duplication of this material without express and written permission from this blog’s author and/or owner is strictly prohibited. 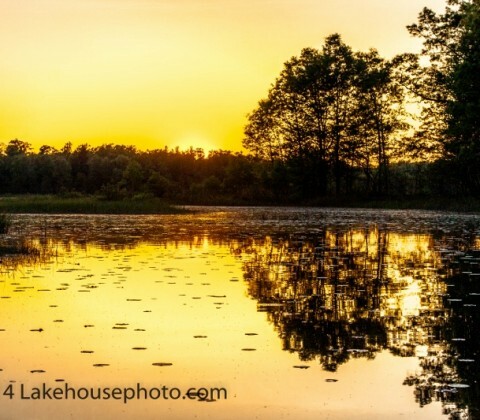 Excerpts and links may be used, provided that full and clear credit is given to Gail Howarth and Living At The Lakehouse with appropriate and specific direction to the original content. Spring is on its way!!! 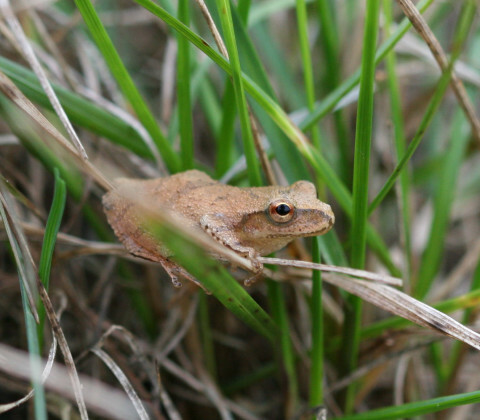 I received the first indication of spring on December 23 and another today. How could this be you might ask? Wasn’t winter solstice just a few short days ago? And on the first full day of winter was there not a major ice storm here in Michigan that left thousands without power for nearly a week? And the following evening was there not a storm that deposited up to 18 inches of new snow in the community where I live? And was it not Christmas just yesterday? Well, of course, winter has only just begun. But I have seen the sign! Spring is, indeed, on its way! I am often amazed by the calm that is present after a storm. 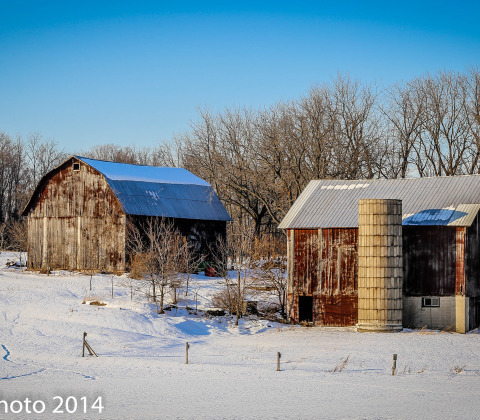 The day after the ice storm was no exception. The sun was shining brightly, as if it had no regard for the previous day’s devastation. No, in fact, it quite literally shed new light upon the situation. As I traveled Interstate 96 from Muskegon to Lansing, I was completely mesmerized by the way the thick layer of ice on the trees, shrubs, and fences glistened. It was pure magic! 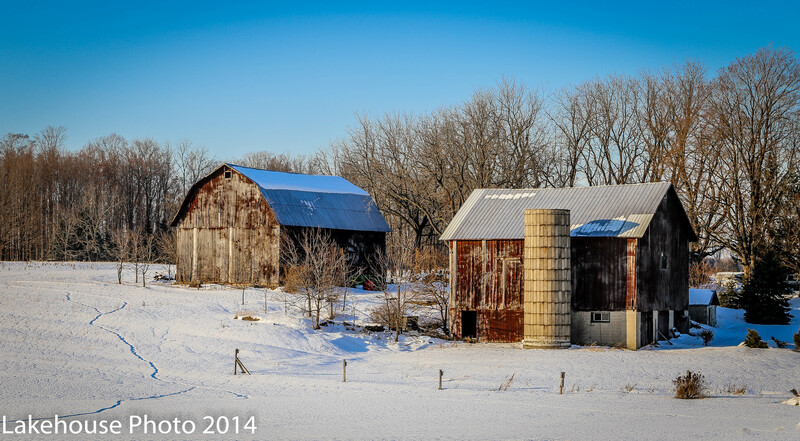 My heart soared, as mile after mile I drove through the enchanted countryside. The return trip later that day was not the same. The clouds drifted in and light snow began to fall. I kept hoping the clouds would disappear, that I might once again experience the splendor of ice and sun. Instead the snow grew heavier, traffic slowed, and the normal two hour drive expanded to over three. The snow no longer drifted lightly in flakes from above, but rather, rained down in thick chunks. Driving lanes were difficult to distinguish, and the red tail lights of other vehicles, invisible until within bumping distance. When I arrived home, I stopped at the end of my driveway to pick up my mail. Though I knew it was deep, it was still a surprise when I stepped into nine inches of freshly fallen snow. Once inside my home, I obsessively watched as the snow continued to fall and pondered the massive task of snow removal that would await me in the morning. Finally, I concluded that watching the snow would not change it or stop it, and I reluctantly retreated to the dining room table where I left the mail. This is where I received my first sign of spring. It is what brings many of us sunshine on the seemingly endless cold dreary days of winter. It catapults us into thoughts of thewarming spring and long luxuriant days of summer. It provides countless hours of pleasurable hopes and dreams for the coming year. So, what is the first sign of spring? It is the delivery of the Gurney Seed Catalog! Followed, of course, by Henry Fields, Burpee, and, no doubt, Jung’s will come any day now. It is with the arrival of the seed catalogs that I know in my heart the commitment that I made to myself to never grow a vegetable garden again will wane. I know that I will soon be pouring over the pages of the catalogs. I will enjoy looking at all the new items that promise bigger, better, and tastier yields. Though, I will just as likely, order the same old reliable seeds I have for years. I will dream about a new ornamental for the backyard, and how it might draw in more butterflies and birds. I will plot my garden, row by row, seed by seed. I will remember the smell and texture of the soil, the sun upon my back, and the taste of home grown vegetables. And, I will escape winter for a little while, if only in my mind. Thanks to Carmel Steffen for always checking my grammar so I look smarter than I am. I can hear the distant rumble of thunder from a storm making its way across Lake Michigan. It will be here soon enough but for now I will enjoy sitting on the back porch for whatever remains of the sun and warm breeze. With as lovely as it is right now it is near impossible to believe that the skies will soon darken and rain begin to fall. Even the birds at the feeder seem to be in denial of the upcoming storm. 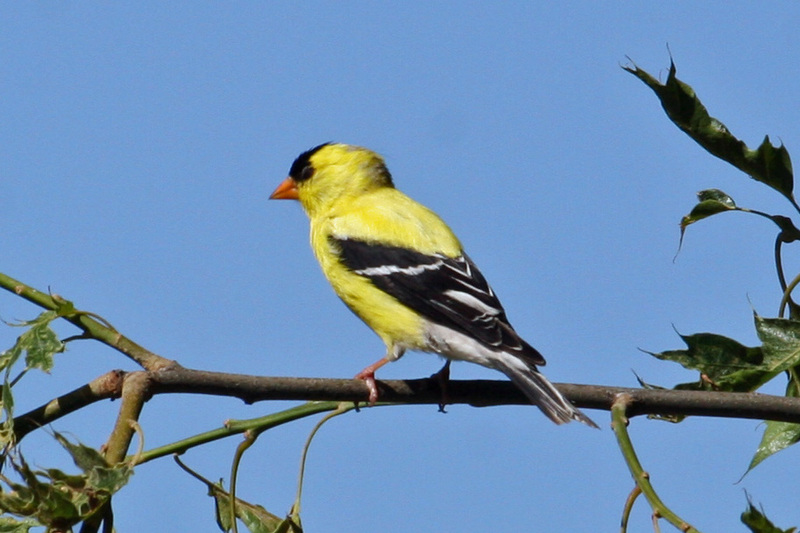 The Indigo Bunting sings sweetly, the Orioles are taking turns sipping nectar from the feeder, and the Red-Winged Black Birds continue to disturb and disrupt as much of the peace as possible. As I listen to the thunder I think about Snapping Turtles. I am in awe of the primal instinct that is triggered during thunderstorms that compels the normally shy creature (female) to leave the security of the lake to find the perfect spot to lay its eggs. Another less awestruck part of me thinks about the damage to my lawn, the money that Muskegon County, the State of Michigan, and the turtle people spent to erect a fence along 2 miles of US 131 to keep the turtles safe from vehicles, all the baby birds I will meet this year yet not watch grow to adulthood, and lastly turtle soup. In the morning, I fully expect to find one or more Snapping Turtles digging holes in the soft parts of my lawn to deposit eggs. Often they dig several holes, but only lay eggs in one hoping to confuse predators such as raccoons or skunks. The trickery seldom works. Frequently I find the nests reopened and surrounded by what is left of the fragile white shells curled and drying in the sun. Perhaps I should feel more saddened about the unborn turtles. But in truth, this sadness is fleeting when compared to how I feel when a Swan cygnet disappears, or when the last of the goslings are gone. Against all odds, a few must survive as there is no shortage of Snapping Turtles at the Lakehouse. I occasionally see them submerged in shallow water or the tip of their nose as they break the surface of the water for a breath air. There are rumors that a frighteningly enormous Snapping Turtle lives in the lake. 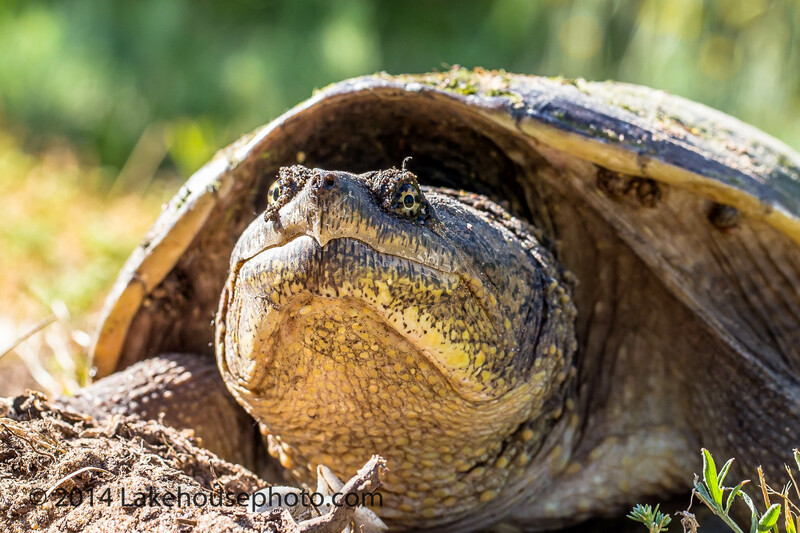 An average Snapping Turtle has a shell a little larger than a dinner plate or nine inch diameter and weighs about ten pounds. Table Top, as he is appropriately named. is no friendly quarter sized dime store turtle. His shell is at least 36 inches in diameter (a medium sized coffee table), his legs the size of small tree trunks and his weight unfathomable. I have not seen him personally, but have heard enough similar accounts to believe that he exists. Mostly I know that there are an abundant number of Snapping Turtles not because I see them, but because of what I do not see. Each year flocks of Canada Geese nest at the Lakehouse. They sneak to the birdfeeder while the Sandhill Cranes are not watching and eat the fallen seed. When the Goslings are born they to come to the feeder. They are yellow, cute, so very silly, and so much fun to watch! But as the days go on fewer and fewer come to the feeder and finally I notice that for the most part the geese are gone completely. The same thing happens to the swan cygnets, loon chicks, and occasionally Sandhill Crane Colt. Sadly in the eight years I have lived here I have never seen a gosling or a cygnet live to adulthood. The small awkward swimming birds are easy prey for the turtles. Although I am saddened every time one of the small birds disappears, I do understand that this is the way nature works. Despite its short life each has served its purpose. I am reminded of an old Native American story I heard years ago. There was once a mouse that lived in fields of tall grass and tunnels below the earth. The mouse wondered what lies beyond the grass where the bright light shone down upon him. He wondered what creatures made the sounds he knows to hide from. 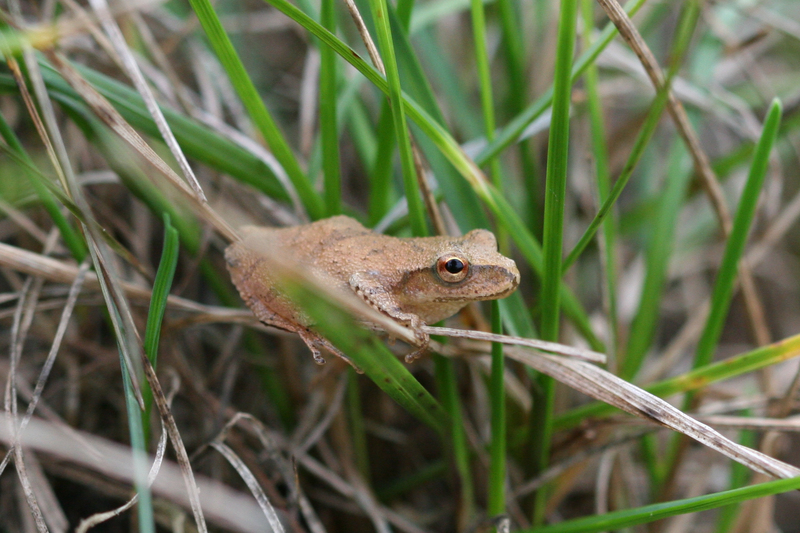 He wondered if he will ever know anything other than the tall grass and the tunnels he travels each day. But he understands that he must live exactly where he is and declares, “I am mouse”. One day while he was foraging for food he heard a terrifying shriek right above him. Talons with sharp claws grasped the mouse and raised him into sky. Later when he awakens he feels the wind beneath his wings and sees with clarity all that lives below and declares, “I am Eagle”. 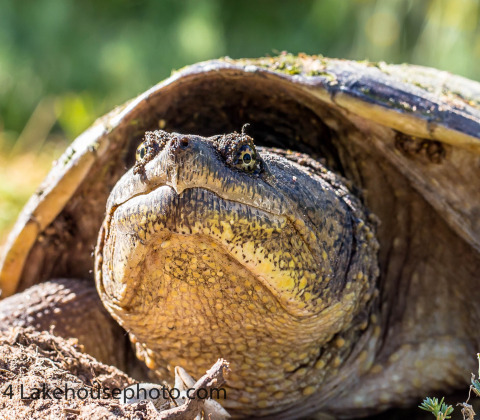 Though the imagery of becoming Snapping Turtle is much less romantic than becoming Eagle, it is none-the-less the same concept. Somehow it gives me comfort. The sky is darkening now and it is time to go inside. As I do, I feel blessed to live in a sanctuary that allows me observe, learn and grow. In this moment I realize that the holes in the lawn heal themselves, that the turtle fence may actually prevent accidents, or save the lives of other animals looking for an easy meal, and that the babies do live on in a different form. I do, however, still think about Turtle Soup! 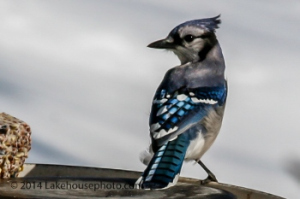 This morning as I was waking, I heard the Blue Jays chattering outside my window. Their conversation was markedly different than it was just a few short days ago. I lingered under the covers for some time savoring the moment. After all, the noisy birds were announcing such good news. They were celebrating the end of a relentless winter, and proclaiming that spring would soon arrive. 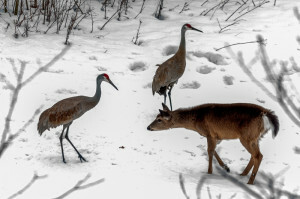 I began to think about Bud and Lydia, the Sandhill Cranes that nest in my backyard. I wondered how far they had traveled on their Northward journey, and hoped that they had not experienced any difficulties. I made an attempt to telepathically tell them not to rush home. Though the snow has begun to thaw, it is still deep enough that there will be little food available. I pondered what wakes an animal from its winter slumber. Or, exactly what tells a bird to leave its warm comfortable winter home in the South? To travel countless miles, often through brutal weather conditions, only to arrive in the less hospitable North, seems quite absurd. If it were me, I would be tempted to disregard the internal niggling that must occur. I would, without thought, hit the snooze button! I would sleep a little longer, or remain in the warmth of the Southern sun. It occurred to me then! How often have I ignored my own internal knowing? How many times have I hit the snooze button when something inside has told me to get up, get moving, or start anew? How often did I stay in the comfort of the sunshine, when I knew I was being called to run through the cold rain? Too numerous to count, I am sure. Spring is nearly here, and I can hardly wait. It is the season that inspires hope and encourages one to dream. It is time to plant seeds, to nurture, and watch them grow. It is the time that we are reminded to listen to our inner knowing, and like the migrating bird, move forward without reason or hesitation. Thanks to Carmel Steffen for her editorial skills. Additional Note: The cranes arrived safely on March 11. © Gail Howarth and Living At The Lakehouse, 2014. Unauthorized use and/or duplication of this material without express and written permission from this blog’s author and/or owner is strictly prohibited. 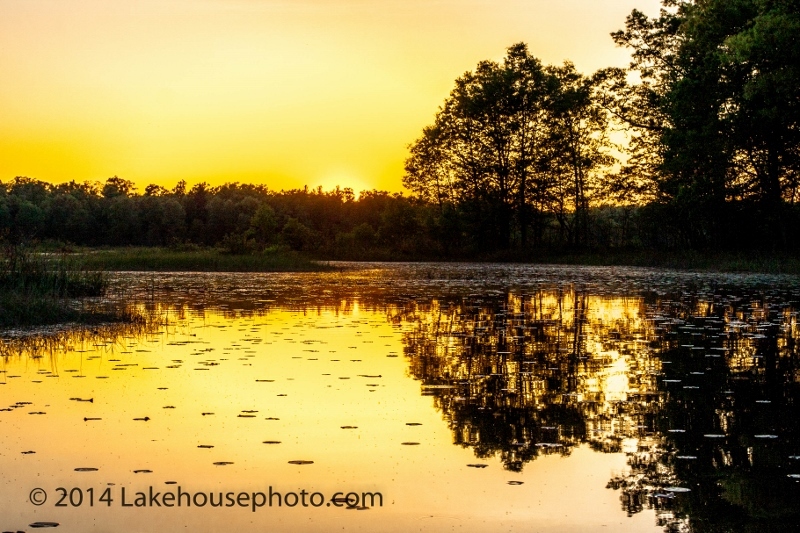 Excerpts and links may be used, provided that full and clear credit is given to Gail Howarth and Living At The Lakehouse with appropriate and specific direction to the original content. 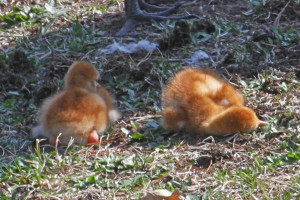 The day the baby Sandhill Cranes are born is one of my most highly anticipated days of the year. On May 1st, I was awakened by Bud and Lydia trumpeting the arrival of this year’s brood. Neighboring cranes replied, either to share in their joy, or to announce the hatching of their own families. With heart racing, I jumped out of bed, and rushed to the backyard with camera in hand. Sure enough, Bud and Lydia stood upon the nest with two little ones under foot. I was beside myself with excitement and could barely hold the camera still. Not only was I overjoyed by the birth of the new cranes, but also, that they had for the first time ever placed the nest in a location I could easily see and photograph. As with all babies I have hopes and dreams for their future. The first hope is that they live one day, then one week, and finally through the fall so that I might wish the whole family farewell as they fly south for the winter months. If they make it through the week, they receive names. Names are chosen based on behavior, birth date, or some other theme that is appropriate that year. Here is a chronology from the time the time I lived at the Lakehouse. 2009 Sadly Roger did not return in the spring of 2009. Lydia chose to mate with Bud, her son from the previous year. 2011 Bud, Lydia, & daughters Corky and Cedar (Named after the parent company of Michigan’s Adventures where Tammy Sue worked , Cedar Point and the Corkscrew Rollercoaster). Neither chick survived the summer. 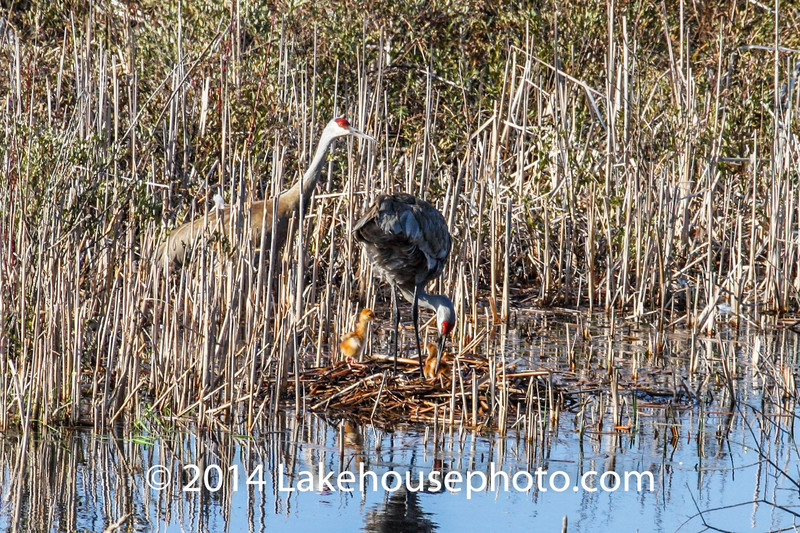 Though many folks do not like Sandhill Cranes, I cannot help but be fascinated by them. It is true that they destroy crops, landscapes, and lawns with their long sharp beaks, as they search for bugs and seeds to eat. But I have no crops, and the little damage they do to my yard is not of consequence. How can one not love a bird that stands nearly four feet tall, eats at the feeder, brings precious babies each year, and allows one to stand just inches away? What a precious and unexpected gift I received when I moved to the Lakehouse! Each year I am delighted by new and old observations. Just this year I learned that the babies swim across open water. Something I have known for some time is that each chick develops its own distinct personality though some themes remain the same year after year. The boys tend to lean back on their knees when resting. The girls sit down. There is always the flapper. This chick propels itself forward as it walks by constantly flapping its tiny wings. Without a doubt, the flapper is the first one to successfully fly as fall grows near. Then there is always one that is a bit lazy or sleepy. This chick will take every opportunity to lag behind, sit down, or take a nap. This chick’s first flight is never pretty. Bud was a lazy/sleepy chick. Still on occasion he reverts to old behavior and forgets that he is a dad and has responsibilities to the babies. Bud’s first flight was the absolute worst I have ever observed. His sister Diane had a picture perfect flight. Roger and Lydia cheered her on as she glided from the nest to my lawn. Bud followed up with a wobbly take off gaining a bit of altitude, then abruptly took a nose dive into the muck. Though Roger and Lydia started off with the same enthusiastic cheer they had with Diane, they quickly fell silent during Bud’s ill timed decent. Soon all four cranes were in my garden. Diane, Roger, and Lydia, were obviously pleased, and ate happily at the feeder. Bud, however, wet and mud covered, hung his head in shame, and would not come near to eat. 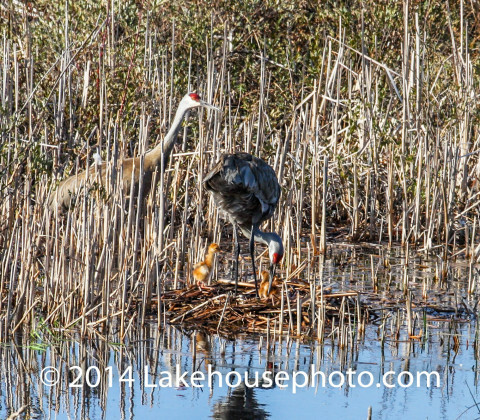 Sandhill Cranes mate for life and can live 20 years. The first year of a crane’s life is the most difficult. On the day the chicks hatch the adults compel them to leave the nest to forage for food. The terrain they nest in is not easy to navigate, and I find it unimaginable to me, as to how the little ones manage. The nests are often surrounded by water that they must swim across. Then there are reeds and cattails, sharp, bent and broken from the previous years, new sprouts of the same plants, muck, sticks, and fallen trees. During the first year there are many predators the colts are ill prepared to defend themselves against including; hawks, eagles, fox, coyote, raccoon, snapping turtles and even cars. The cranes have provided me with laughter, wonder, joy, and some sorrow. In return there is so very little I can do for them. I feed them, love them, cherish them, and adore them. I hope that I can provide a safe haven that they will come home to year after year. I am painfully aware that despite my best efforts, I cannot guarantee that Rusty and Red will make it one more day, week, month, or until we say goodbye at the end of summer. Each day I count, 1 baby, 2 babies, 1 adult, 2 adults, and am grateful and relieved that all are still here. I cannot guarantee that Bud and Lydia will safely return each spring. But I hope and I pray, and I wait each year for them to do so. These are after all wild creatures. They are not bound to me or to this place, but to their natural instincts. I can only hope that these instincts will lead them home for many countless years to come. Spring has come to Michigan. We know this because it is April 20th. It must be spring! And yet, the bitter wind is howling, the temperature is below freezing, and it is snowing. This followed by a week of flooding like I have never seen in my more than 50 years. So many of us are convinced that spring has not come, and that it may never come this year. Still, the plants and the animals know that spring has come! Each year there are signs that spring is on its way to the Lakehouse. First the Red Winged Black Birds arrive in mid February. They come in droves, noisily ending the quiet solitude of winter. Some folks find them annoying. They are, indeed, a greedy bird and often bully others. But, I find myself grateful as I watch and listen to them at my feeder, as they replenish their bodies from their long journey North. By the end of February I start looking for my favorite couple. Each year I worry, hope, and pray, for the safe return of Bud and Lydia, the nesting pair of Sandhill Cranes that live at the Lakehouse. This year they were a week later than usual and I feared they had perished over the winter. As a result, Bud wasted no time in dancing for, and throwing twigs at Lydia to entice her to do whatever birds do to get babies. The courtship is comical and tickles me to no end. Shortly after the cranes come home, a variety of migrating ducks and Canada Geese begin to arrive. Each year, all the birds share a small patch of water where the ice has melted, with the two Mute Swans that are here year round. The swans at the Lakehouse are extremely antisocial and it is often amusing to watch their less than hospitable interactions with the new arrivals. I have come to consider Canada Geese the clowns of all waterfowl. They honk all day and night for no apparent reason. They tease and taunt all the other birds until they get a reaction. I have even watched them fly up high above the lake, circle, only to drop back down onto the ice, chest first, to slide across the slick surface. As the lake begins to thaw the Bald and Golden Eagles stop by for a fishing trip. One year there were at least 28. Quite a sight to see! The Eagles have two fishing methods. The first fits the classic image of the Eagle swooping down into the water, and reemerging with a fish in its talons only to fly away to some unknown destination to eat its prey. The second, less spectacular or publicized method, is for the Eagle to stand upon an ice ledge, grab an unsuspecting fish from the frigid water, place it on the ice just inches away, and unceremoniously begin to eat. The second, less glamorous method, is the most common at the Lakehouse. At the end of March, the Crocus began to bloom and the foliage of other plants, such as primrose, hyacinth, and daffodils begin to peak through the soil or snow. Soon, the first morel mushrooms will appear. For me, just the thought of morel mushrooms in the early spring, induces obsessive night time dreams of hunting for and finding bushel upon bushel of the delicacy. The reality of mushroom hunting is that it seldom, if ever, matches the imagination. 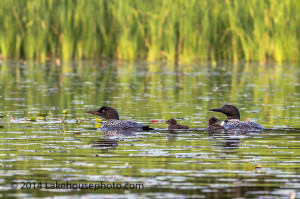 Lastly, on April 18th, I awoke to the haunting call of my beloved Loons. 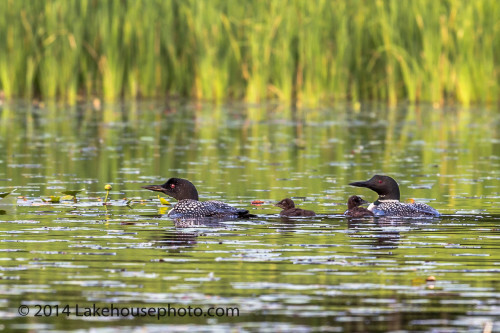 The loons have not always lived at the Lakehouse. They came one year after a terrible, yet, magnificent thunderstorm. The thunder and lightning was constant! Light flashed brilliantly all about, lighting its erratic path from heaven to earth. The thunder rumbled and the house groaned and shook. Lying in bed I thought of Dorothy and The Wizard of Oz, and wondered if the house would still be standing when I awoke. In the morning, the house was, indeed, still standing. The sun came out, and for the first time, I heard the call of the Loons. I wept with joy. The spring of 2013 is certainly not the spring we all dream of during the dark days of winter. But spring is most certainly here. The plants know it. The animals know it. And the light grows longer each day. The cold and dreary days have not stopped nature from its annual rebirth. It is the time of year for all of us to renew our hopes and dreams, and to be born again. Thus I take my cue from nature and embrace and rejoice in the spring of 2013. I hope you will too.